After travelling across Barton Broad on the River Ant, the river diverges. One route takes you to the villages of Wayford Bridge and Dilham whereas the other takes you to Stalham and Sutton. The villages are sign posted so you should have no trouble choosing the correct direction to travel. Stalham is a small town to be found at the furthest point of this branch of the river. It is also the home of the largest boatyard on the Norfolk Broads - Richardsons. Richardsons host over 100 of their own cruisers so unless it is a turnaround day, i.e. when holidaymakers leave or take over their boats, there are usually moorings available as many of their own craft will be out cruising. Moorings are also available at Stalham Staithe, adjacent to the Museum of the Broads. 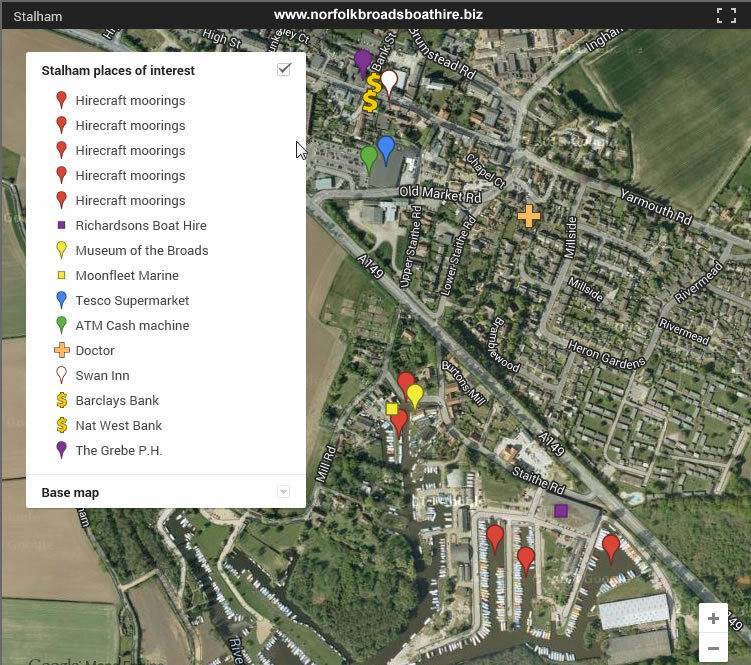 You will need to look at our map linked below to get an indication of where these are. Take the left hand channel rather than entering the boatyard to find them. They are more picturesque but are limited and popular. As such it is wise to consider the boatyard moorings as a plan "B". From either of the moorings you have a 10 minute walk to reach the Stalham main street. Eating and Drinking: Swan Inn - Restaurant and bar food. To be found on the main street. The Grebe - Bar food. On the main street. The Harnser - Bar food. Turn right at the main street towards Sutton. The Mermaids Slipper is a restaurant close to the staithe. Hunters Cafe and Restaurant is on the main street. Other Services: Tesco Supermarket - five minutes walk from the moorings. Newsagents - use Tesco. In Stalham twon centre you will find a butchers, fish and chips, Chinese and Indian Takeaways, a doctor's surgery and Boots the Chemist. There are now no banks in Stalham. However, Tesco's has a cash withdrawl machine on-site. Public toilets and waste disposal are available within the Richardson boatyard complex. TIP: If you can get in at the public staithe moorings, these are the nearest to Tesco and the high street.